1 in every 5 Americans will develop skin cancer, but now gone are the days of disfiguring scars or having to seek additional costly cosmetic reconstruction after skin cancer removal treatment as the #1 skin cancer doctor, top plastic surgeon, and founder of the world renowned Skin Cancer Center (www.theskincancercenter.org), located near Seattle, Dr. Justin Piasecki, has pioneered plastic micrographic surgery, a unique procedure that combines the Mohs surgery with cosmetic reconstruction, making it the most effective (99% cure rate), cost/time efficient, and convenient approach to skin cancer care. Dr. Piasecki is the sole surgeon in the world certified to offer this one-of-a-kind solution and the Skin Cancer Center the only one-stop facility that allows patients the opportunity to have reconstructive surgery following their skin cancer surgery in the same outpatient setting. Skin cancer runs in my family. My Father has it and I have signs of it. I had gone to see a specialist, but he seemed a bit wacky and I was a bit nervous. I also did not want any large or noticeable scars on my face. Well that was a few years ago. I choose to let it go and not get it taken care of. Now, I have two more spots that I need looked at. I am one that will say upfront, that it can be frightening, but something that does need to be taken care of or it will spread! Dr. Piasecki graduated from Stanford with honors, Vanderbilt Medical School, completed a 5 year Plastic Surgery Residency at the University of Wisconsin, and a Mohs Surgery fellowship at the University of British Columbia, is board certified by the American Board of Plastic Surgeons, the American Board of Facial Plastic and Reconstructive Surgery, and has trained under some of the most respected dermapathologists in North America. He also directs the AAAHC accredited, Medicare Certified Operating Room and internationally acclaimed Skin Cancer Center. Cancer warning signs include a spot or sore that continues to itch, hurt, scab, or bleed for over two weeks. Also: any growth, mole, beauty mark or brown spot that changes in color, textu re, size, thickness, is irregular and asymmetrical, and bigger than the size of a pencil eraser. 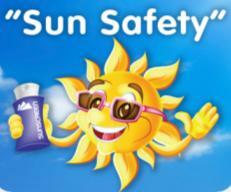 Use sunscreen frequently and liberally, even on cloudy or hazy days. Do NOT go to a tanning machine to get a base tan, it radiates your skin in a harmful way. Purchase a “broad spectrum” or “full spectrum” sunscreen. This provides protection from every form of light. There are two types of light that can harm your skin- UVA and UVB. No one agrees on a “good SPF number,” but a minimum of 30 is recommended by most. Studies have shown that certain red foods- particularly tomatoes and apples, help reduce the risk of sunburn. Check the sunscreen expiration date. Its shelf life is shortened if exposed to high temperatures. A good suggestion is to start fresh each summer. Some ingredients to look for in sunscreen include avobenzone, cinoxate, ecamsule, oxybenzone, and sulisobenzone. To increase clothing SPF, use laundry additives like Sun Guard. One packet washes a skin-saving SPF 30 into every garment which lasts up to 20 washes. Sunglasses protect your eyes from UV rays and reduce the risk of cataracts. They also protect delicate skin around the eyes. People often forget about their scalp- mist your scalp and hairline with a spray sunscreen. When sunburned, take anti inflammatory medication like Aspirin or Ibuprofen on a regular basis.